Don't mess with man's best friend. Man will go to far lengths to save his four-legged best friend, including, apparently, squaring up against a good-for-nothing kangaroo. 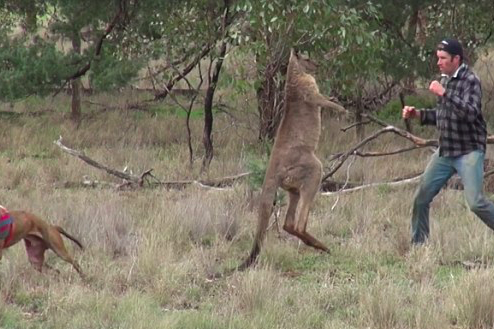 The aforementioned hilariously heroic act was caught on camera during a hunting trip in New South Wales, Australia, and the scene has since gone viral. The dog’s owner, who is in the truck, suddenly jumps out and rushes toward the scene, where the kangaroo is seen holding the pup in a headlock. The man delivers a quick kick to the marsupial's legs, causing it to release its grip, and the two then square up, with the man socking the kangaroo once in the face, sending it hopping away.